In retrospect, it was very fortunate for David and Muriel Robinson that Earlscliffe came on the market in 1969 and not some years later. The decade has been referred to as the swinging sixties when many people developed interests away from the home. Gardening was not yet the popular pastime that it is today. In 1964 the Robinsons had moved into a brand new bungalow in the first housing estate in Malahide called Ard Na Mara. They had enjoyed the challenge of owning the first house built there and in building a garden from scratch. However by 1969 the small garden they had been making around the bungalow was complete and David was looking for the challenge of a new home with a larger garden. Earlscliffe with its five acres was ideal but it seemed inevitable that it would be beyond their reach. Miraculously, the large well-manicured garden intimidated would-be purchasers at the time. The house did not reach its reserve at auction and David and Muriel subsequently bought it. With the Knowles' full time gardening staff available up until June 1969, Earlscliffe garden had developed in a labour-intensive way. There were eight lawns to be mowed and many of these were surrounded by tall, well clipped hedges. There were also beds of roses, shrubs and herbaceous plants to be weeded. As the five acres now had to be maintained without outside help, David Robinson decided to simplify maintenance by reducing the grass area, eliminating all internal hedges and using herbicides as far as possible to control weeds. To their neighbours the simplification process seemed rather brutal. One Saturday morning shortly after arrival, David killed five of the lawns with a herbicide and planted small shrubs directly into the dying sward. This action was taken, as maintaining shrubs is much less time consuming than mowing grass. In the following few years, they removed about 500 metres of tall, broad hedges inside the garden. This greatly reduced the workload as previously the gardener and his helper had spent about three weeks cutting the hedges (apart from the time required for cleaning up the clippings) and they repeated this operation twice a year! 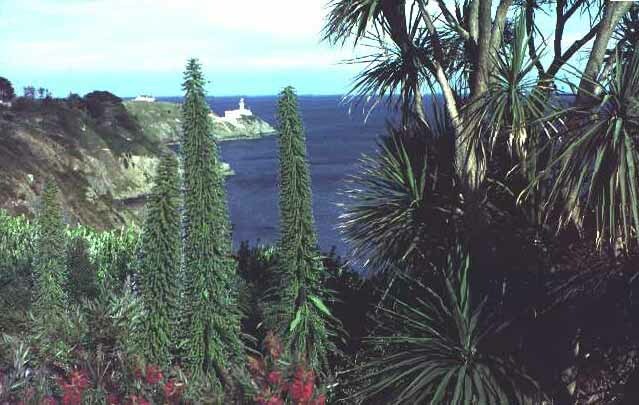 The large wind-pruned pines and cupressus were allowed to stay and now frame exhilarating views of Dublin Bay with the Baily lighthouse to the North and the mountains of Wicklow head, which protrude magnificently from the coast, further south. David's background as a horticulturist scientist working, among other topics, on the elimination of soil cultivation in fruit crops enabled him to transfer this knowledge to garden maintenance. Spraying a low concentration of a soil-acting herbicide uniformly over clean soil surface controlled annual weeds for a period of many months. Spot treatment with appropriate leaf-acting herbicides eliminated perennial weeds along with any annuals that survived the soil-acting treatment. No digging or cultivation was done except during planting and the problem of weed control was reduced to a very low level. Whist David realised that the garden had a good microclimate being close to the sea and sheltered from the north by the Hill of Howth, he was unaware at the outset of the full potential of the site. Once the formal gardens were cleared, David started planting. "I wanted to explore the limits of plant hardiness at 53. 3 degrees latitude and also develop a labour-saving garden" said David to James Wickham in an article for the RHS publication, The Garden . David's doctorate had been on weed control and he used all of his skill and knowledge to bring the best techniques to the maintenance of the gardens at Earlscliffe. "My wife and I have never had any outside help so I cut every corner there is to be cut. I don't use fertilisers on trees and shrubs, insecticides or fungicides and I don't hoe or cultivate after a new plant is in the ground. No plant gets any artificial protection in the winter or special attention". Although the soil tends to be shallow it has the advantage of being acid and so rhododendrons and other lime hating plants grow without difficulty. These are the most colourful plants that thrive here but the subtropical (Climatic Zone 9) plants that only survive in the mildest parts of Ireland but thrive at Earlscliffe are much more interesting. The extent of what can be grown at Earlscliffe is was not simply due to the result of skilled plantsmanship but is mainly due to a favourable microclimate. David's background was in horticultural research and his aim in developing Earlscliffe was not just to create an attractive garden, but to also find out facts that could have some commercial relevance. For example, he had a vision in the 1960s that Ireland could become an important producer and exporter of cut foliage such as Eucalyptus, a genus which grows well in Ireland . He raised over 100 different genera of Eucalypts in the garden to see which would do well in the Irish climate. This research benefited the cut foliage industry which finally took off around the mid 1990s. However, it was in the area of plant hardiness that Earlscliffe is renowned. As far as David was aware, this part of Howth can grow a wider range of plants than any other area of similar latitude. For more details of his research into plant hardiness, see the paper that David gave to the International Magnolia Society in 2001. James Wickham, The Garden Magazine Volume 126 Part 11 866-9, RHS November 2001.